MediaTek is pretty much unknown in the U.S. as most of its chips are found inside devices that are made and sold in China. But if current reports are true, Apple is about to give the company a huge shot of publicity, stateside. Thanks to its quarrels with Qualcomm, Apple appears to be ready, willing and able to replace the Snapdragon modems that might have been deployed on the 2018 CDMA flavored iPhone units, with MediaTek's version of the broadband chip. 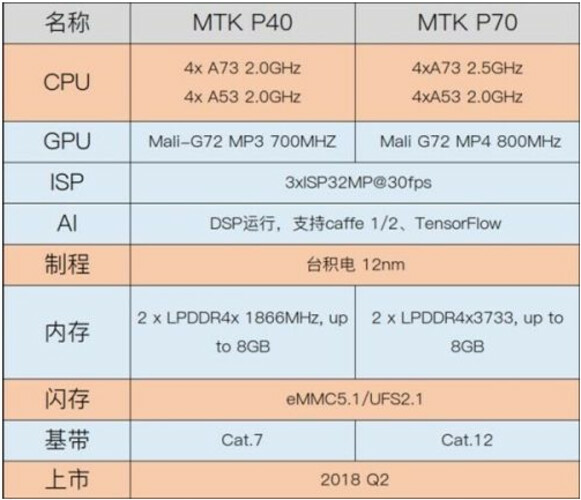 MediaTek is also believed to be working on a couple of mid-range chipsets, the Helio P40 and Helio P70. If the rumors are legit, both are being built by TSMC using the 12nm process, and figure to arrive in Q2 of 2018. The Helio P40 carries an octa-core CPU with four A73 cores clocked at 2GHz to do the heavy lifting, and four A53 cores, also clocked at 2GHz, for the light housekeeping. The GPU is the Mali-G72 MP3 clocked at 700MHz, and the chip supports cameras up to 32MP. The chipset is compatible with up to 8GB of RAM. There is support for LTE Cat. 7. The Helio P70 also carries an octa-core CPU. The configuration is almost exactly the same as found with the Helio P40 except for the faster 2.5GHz clock speed available on the two A73 cores. The P70 comes with a quad-core Mali-G72 GPU clocked at 800MHz, and is compatible with 8GB of LPDDR4X RAM. The Helio P70 is said to be expected inside full-screen Xiaomi Redmi models, and handsets produced by Vivo, Oppo, and Gionee. Low sales of the high-end Helio X30 chipset, found this year inside only two two handsets (Meizu Pro 7 Plus and Meitu V6) forced MediaTek to back off a new Helio X SoC for 2018. As we recently told you, the company's market share declined from 18% in 2016 to 14% last year. 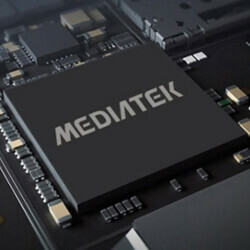 "MediaTek said to be have a pair of"... I think there's something wrong in the title, grammar wise. Or it's rather "to behave", perhaps? Whatever that means! Only God knows the ways of Alan. That's so noticable...Even by me considering English is not my native language. You are right. Shouldn't it be "said to have" or "said to be having"? Anyone have a phone with MediaTek chips, can give us an idea of how well devices perform with them vs lets say Apple's A series or Qualcomm SD series or the Exynos from Samsung? Not talking about benchmarks as they don't mean jack. Talking about someone who owns a phone or 2 with competing hardware who can provide a perception of performance based on their usage. P20 performed good in the xa1 series. On par with 625 type phones. Had a xa1 ultra and a moto z play, not much difference in day to day use. One thing nice about the Qualcomm is larger base of aftermarket chargers. Mediateks charge quite slow and only option for them are the pump express chargers which basically do not exist in the west. Thanks for the response. Sound like a midranger that I wouldn't be considering as an alter active daily driver So8nds like this is why Qualc9mm is where they are while many try to claim they have a monopoly or that every OEM should invest in chips. This is why they shouldn't. Because the chip market would be diluted with garbage and o my the best if gonna sell anyways. Look at tablets. When Android cane, cheap crappy tablets came out of nowhere and then diluted the market to where on Samsung and Apple have the lions share. We don't need OEMs to sell garbage to help.us identify what is best. QC is where they are because no one can compete on their me so of quality and performance. I haven't gotten excited about anything by mediatek in forever and that still hasn't changed. Same here! But im hoping mediatek will be able to catch up with SD. We really need competition in SOC industry especially on androids. Specs aside, mediatek chips performed poorly for me and for many people i know. I have used Le Eco le1s and it has overheating problems, poor performance and hardly any developer support. Its the best currently available for non-iOS devices and phone’s powered by Adrenos. It's 2018, ladies and gentlemen. And if an SoC launched in 2018 doesn't support ARM's DynamIQ supported A55s and A75s cores then they're 'ANCIENT' already. Qualcomm is expected to launch Snapdragon 460, 640 and 670 SoCs in the first quarter, and all of them support DynamIQ. It's about time for Mediatek to catch-up with Qualcomm. G'Day! With those garbage gpus they're bound to fail.